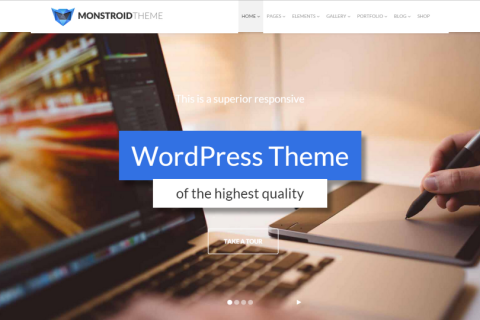 Monstroid Theme Review – Can it Stand Up to the Claims? Monstroid is a theme from Template Monster that’s considered to be a WordPress theme on steroids. They claim you can literally build absolutely ANYTHING with Monstroid. Big claim. Very big claim. So, does Monstroid live up to the hype? Let’s take a look. Monstroid is powered by Cherry Framework 4. It has built-in layouts for various types of blogs, landing pages, business sites, galleries, portfolios, magazines, online stores, and more. It has editors so you can create your own layouts. You can modify your own header and footer elements using the Static Area Builder. You can create your own templates using the Shortcode Template Editor. It includes 20+ premium plugins that provide some high-end features and it has free child themes to give you different layouts and designs. It’s fully responsive and Retina ready to look great on any possible screen size. It’s SEO optimized to help you rank higher in search engine results. It’s also designed to rank high with Google Insights. It’s WPML ready and fully localized, so it doesn’t matter what language your readers prefer. It includes Google Analytics. It includes all (over 100!) of the PSD files and of course you can customize them any way you want. It includes over 500 Google Fonts. You can modify the styles of each font. It has dynamic CSS and a custom-built compiler that will minify your CSS to improve site performance. There are over 50 royalty-free hi-rez images that you can use in your content. Like many themes it’s completely compatible with WooCommerce. Monstroid goes a step further by including a set of product pages. It includes 24/7, 365 support via live-chat. It also includes extensive documentation that includes text and video tutorials. They step you through installing and customizing the theme to your needs. Monstroid includes lifetime updates of the framework and themes. There are six different layouts to choose from. Choices include boxed with 1170 pixels, boxed with 960 pixels, grid, full width with left sidebar, full width with right sidebar, and full-width with no sidebar in both 1170 and narrow columns with 1170 pixels. There are four different styles including grid, flat, masonry flat, and masonry. You can also drag and drop elements to create your own designs. These home pages cover a lot website designs and niches. 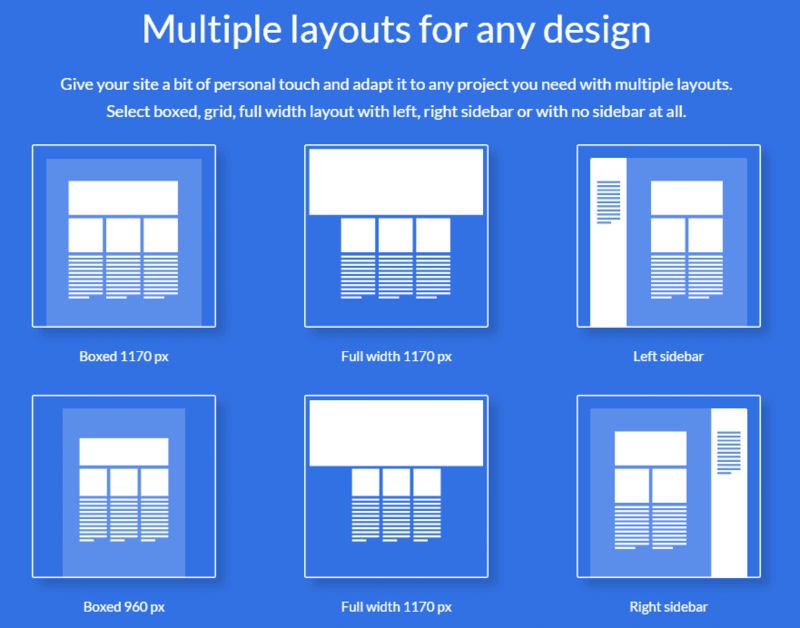 Combined with the layouts and plugins you can have any type of home page you want. These templates work well with business sites that provides products or services. 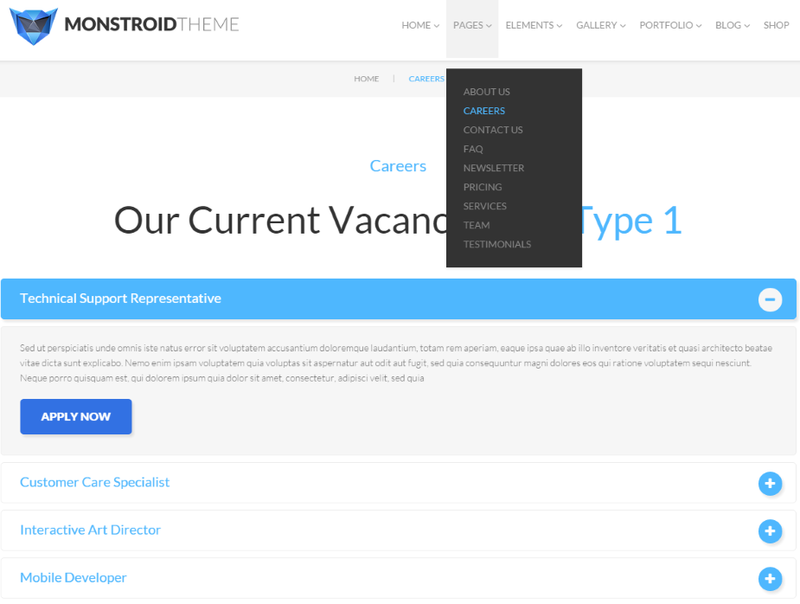 Most themes that provides templates don’t includes pages such as FAQ and Careers. Infographics – this includes icon combinations, social icons, counters, progress bars, and pie charts. Interactive Elements – this includes parallax scrolling, full-width portfolio sliders, cover boxes, banners, and a clients carousel. Common Elements – this includes buttons, tabs, accordions, and toggles. Typography – this includes the various elements such as headings, columns, drop-caps, links, block quotes, highlights, lists, and separators. These elements give your pages and posts and lot of functionality that’s actually usable and looks great. They can be added to pages and posts and are great for photography, art, or any type of product. There are nine portfolio layouts with three main styles. You can display your portfolio as a section within your pages or in a post. There are several different styles that work in different ways. You can have images with text that opens within a lightbox. The images show an animated button when you mouse over them. Another style will display the text when you mouse over the images. Another style with open a page with detailed information about the portfolio item. There are four different types of blogs. Two of them have three layouts for a total of eight layouts. The various blog layouts are different enough that you won’t believe they’re from the same theme. You can have a regular blog, something that looks like Pinterest, or some that looks like a Facebook timeline. All of them look elegant and operate smoothly. They’re clean, minimal, and keep the focus where you want it – on your content. Rather than starting from the main template you can install one of the child themes and start modifying those, or you can use them as-is. They include various layouts and topics such as cars, photography, education, food, furniture, cartoons, and more. More child themes are provided each month. There are currently 17 child themes available and more are released every month. 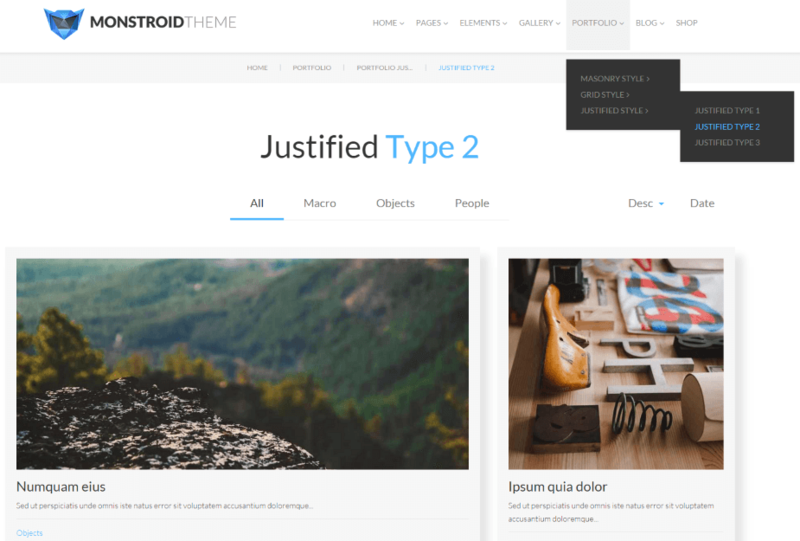 Child themes are free to Monstroid users. The child themes are nice because they do the work for you. Even if you decide to make changes to the child theme, it’s much easier to start with something that closer to what you want. They’re also good for getting ideas of layouts and they show you designs that you might not have known was possible. Monstroid Skin switcher – this lets you quickly switch skins and choose styles. Styles include Material, Flat, Metro, Minimal, Grunge, Skeuomorphic, Low Poly, Retro, 8-Bit, and Non-Standard Geometry. Monstroid Wizard – this is an installation wizard for the theme. 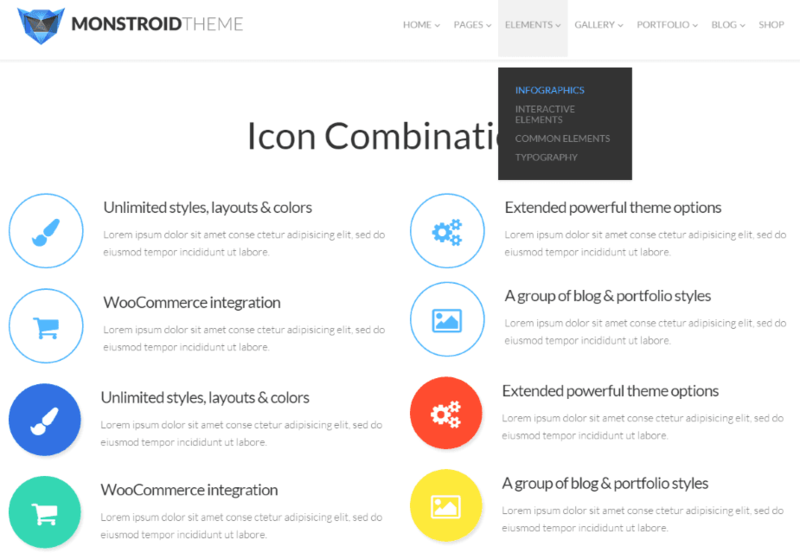 You can easily install all of the theme’s components from the cloud with a single click. MotoPress Slider – this is a powerful slider with dozens of styling options. It will make almost any kind of slider you can imagine. Cherry Data Manager – this is an easy to use import/export plugin that lets you move your site from one host to another. This feature alone can cost close to the price of the theme. Cherry Team – this is a new post type for team member profiles. You can edit them just like any other post. Cherry Services – this is a services post type with custom fields and styles. Cherry Portfolio – this builds galleries and portfolio pages. They includes lots of visual effects. Cherry Shortcodes – there are tons of shortcodes to modify your pages and posts. Cherry Testimonials – this is a testimonials post type. You can modify them just like any post type. 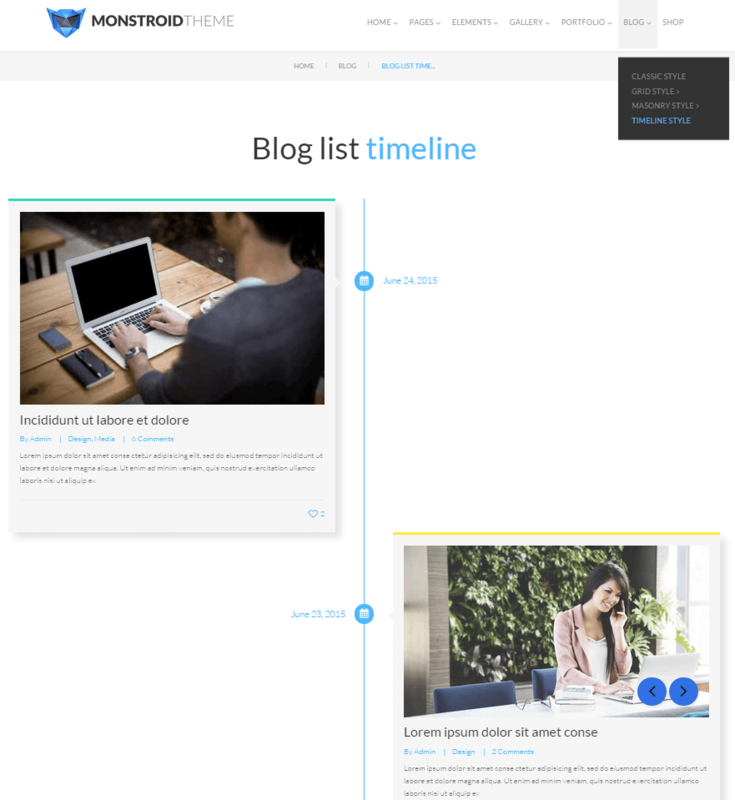 Cherry Blog Layouts – you can add or remove sidebars, change the position of posts, and more. Cherry Custom Sidebars – easily add new sidebars from the admin panel. Cherry Simple Slider – this is a simple slider that lets you consolidate images and videos to create slides with captions for different pages of your site. Cherry Grid – this lets you tweak your layout’s architecture. You can adjust the header, content, or footer’s features such as inherit, wide, and boxed. Cherry Charts – these let you visually show any kind of numerical data. There are several types of charts including pie, doughnut, bar, and progress bar. Cherry Social – this is more than just a collection of social buttons. It provides some high-end features such as login and registration, share and like, and follow. It even has an option for commenting. Cherry Mega Menu – this provides a large menu panel where you can add links, images, buttons, lists and more to the dropdown menu. Cherry Shortcodes Templater – this lets you create and reuse an unlimited number of page templates. Cherry Ranking – this is a star ranking system that allows visitors to rank products. Cherry Plugins Manager – this lets you upload, active, and delete all of Monsteroid’s plugins from an easy to use panel. MotoPress Editor – this is a visual editor that lets you drag and drop to create pages and styles. Mailchimp for WP – this is an easy connection to MailChimp so you can collects emails. YITH Woocommerce Compare – this is a WooCommerce extension that lets users compare products in a single table. YITH WooCommerce Wishlist – this is a WooCommerce extension that lets users share their wishlists with their social networks. White Label Plugin – this allows developers to customize the dashboard, menus, logos, etc., with their own brand. This is an impressive list of free premium plugins. Some of them are high-end and add a lot of value. The data manager, MotoPress slider, layouts, mega menu etc., usually cost some good money to buy separately. Even if you could get them for free from other sources, these work with this theme. You can use them without having to worry about compatibility issues or quality of programming. Others, like the various post types, just save you time because you don’t have to create the post types manually. They’re also higher quality than what you can make in a few minutes. With the vast amount of features available it’s easy to believe you can make any kind of site you want. There are more than enough styles, layouts, designs, elements, shortcodes, and plugins to make your very own unique website that looks and feels elegant while loading fast. It’s rare to find a theme that really can create any type of site. 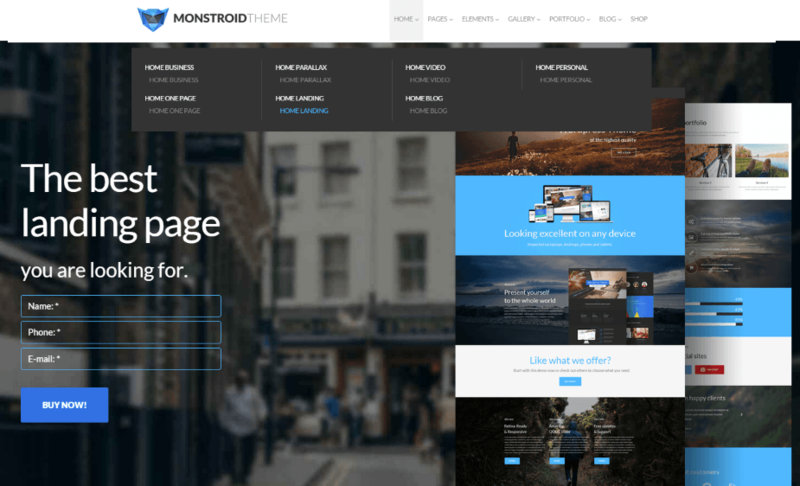 With this one theme you can create a blog, business site, landing page, personal website, gallery, portfolio, magazines, eCommerce, and more with various styles of each one. You’re not limited to a predefined layout or specific niche. The challenge with Monstroid isn’t to see what you can do with it… it’s trying to see if there’s something you can’t do with it. Good luck with that. 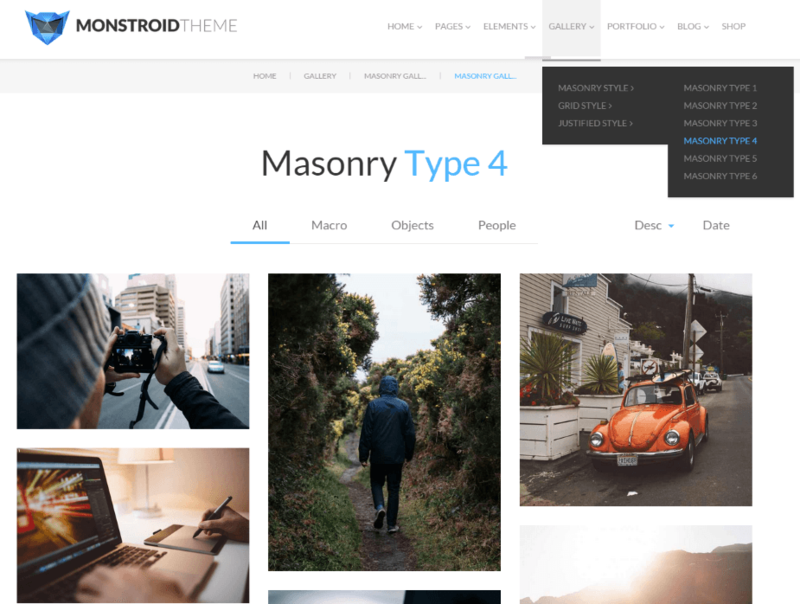 When you consider the layouts, child themes, premium plugins, and PSD files, all at a price of $79, you truly get a lot for your money with Monstroid. 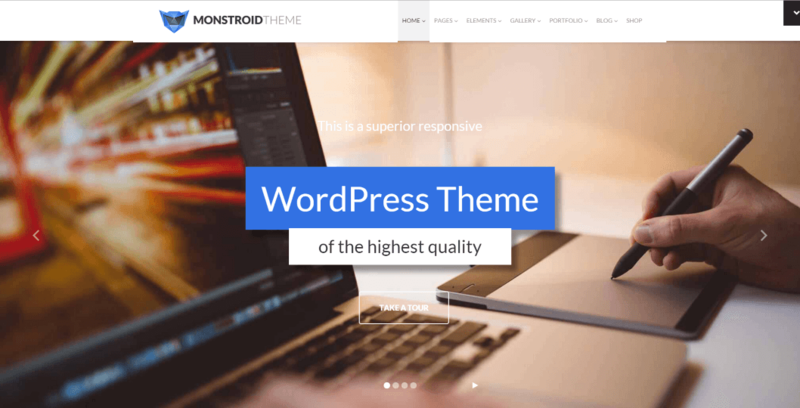 Best of all, TemplateMonster has issued a coupon for our subscribers and readers for a 50% discount on all of their WordPress themes, including Monstroid. How about you? Have you tried Monstroid? What do you think about it? What are your favorite features? Did you create a unique layout or use the built-in layouts or child themes? Tell us about your experience in the comments below.